One of Indiana’s most outstanding examples of the Second Empire style, and the only example in Switzerland County, the Schenck Mansion is individually listed in the National Register of Historic Places. 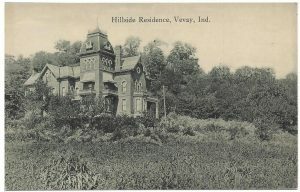 “The house on the hill” is located in the beautiful Ohio River town of Vevay. Built by Benjamin Franklin Schenck, son of a fabulously wealthy “hay king” of the steamboat era, this palatial mansion was the marvel of its time with its four storied tower, thirty-five rooms from basement to attic and five baths. This house was built in 1874 at a total cost of $67,000. Its towers, bay windows, high ceilings and spacious rooms are characteristic of the architecture of the time. The architect of record was George P. Humphries of Cincinnati. Amazingly, the original architect’s plans have remained with the mansion.Benjamin Franklin Schenck was born in Louisville, Kentucky, November 3, 1834. He attended law school at Poughkeepsie, New York, was admitted to the bar in Vevay, but instead of practicing law entered the mercantile business with his father, Ulysses P. Schenck. Branching out on his own, young Schenck purchased the Vevay Weekly News in the 1850s and edited it for several years. He also was in partnership for a time with John Henry in the manufacture of ink. In November 1874, on account of failing health, he and his family spent the winter and spring in Florida. He was able to spend the next two summers in his newly finished mansion in Vevay, but returned to Jacksonville, Florida where he died in April of 1877 at the age of 42. Mr. Schenck died before his palatial home was finished. Mrs. Celestine Schenck lived in the mansion intermittently until her death in December 1885 and became at the mercy of village boys with destructive tendencies. In 1945 the mansion was acquired by Clarence and Lulu Wiseman who lived here and also used it as the clubhouse for the Switzerland County Saddle Club and the second floor as a tenement. The circular driveway at the bottom of the hill was originally a quarter-mile horse track which later became Wiseman’s Trailer Court. The mansion was sold in 1966 to Major T. and Ruth E. Jester, who sold all but six acres around the mansion. The Wisemans sold the mobile home trailer court to Ervin and Lynn M. Wilson. Burrel C. Farnsley and Alexander “Sandy” Speer of Louisville purchased the mansion from the Wisemans in 1972 and began restoration efforts. In 1981, they sold the property to their friend Mark C. Miles and he continued the restoration efforts. The current owners, Jerry and Lisa Fisher of Vevay, purchased the property in 1998 after it had been on the market for several years. They completed restorations to the mansion in 2000 and opened the Schenck Mansion as a bed and breakfast. The guest rooms were named after the Schenck family and one for the Wisemans. In 2009, the quarter-mile track and property to the east of the mansion was purchased from Ervin Wilson and the trailers were removed. The extensive landscaped terracing, vineyard, patio and water features were added soon thereafter. The Schenck Mansion presents an imposing appearance with its four porches, seven balconies, eight chimneys, thirteen fireplaces and fifty+ windows. The exterior trim is all made of tin rather than wood and the original slate roof is intact. The mansion, with its five bathrooms, was built in a period when one bathroom was considered a luxury in a large city dwelling. The house was originally designed with running water which was supplied from a reservoir located on the hill. Each bathroom contains a walnut cased copper lined tub. Provisions were also made for central heating with a gravity hot air system. Originally the mansion was lighted by built in gas fixtures. Since there was no natural gas system in Vevay at that time, the mansion contained its own carbide generator to manufacture gas. The interior shutters and trim were originally faux grained. The game room is the only room that the trim and shutters have not been painted over the years. The butler’s pantry has shelves, twenty-six drawers and cupboards of various sizes from floor to ceiling. Faux graining can be seen faintly on the drawers. Originally the mansion had a summer kitchen that was attached to the far end of the house.